Both the spire and roof of the cathedral collapsed and footage from the scene showed flames inside one of the building's two towers. Twitter users shared their memories of visiting Notre Dame in response to the blaze. "Perhaps flying water tankers could be used to put it out," suggested the US president. The former US president called Notre Dame "one of the world's greatest treasures". The Spanish Prime Minister tweeted in both Spanish and French calling the fire at Notre Dame a "catastrophe for France and for Europe". "The flames have ravaged 850 years of history, architecture, painting and sculpture. This is going to be hard to forget. France can count on us to help recover the greatness of its heritage." "Deeply saddened by the news of the fire at Notre Dame. 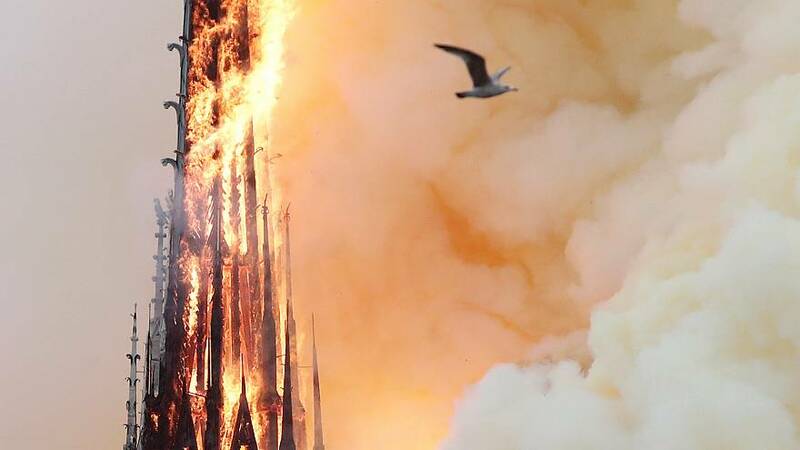 It is not only a national disaster for France, but also a serious loss for the world's cultural heritage. @emmanuelMacron, we stand at the sides of the French people," wrote the Greek prime minister. British Prime Minister Theresa May tweeted saying her "thoughts are with the people of France tonight and with the emergency services fighting this terrible blaze". "I am following minute by minute the fire that is preying on Notre Dame. Our Lady of Paris belongs to the whole of mankind," wrote the EU Commission President. "What a sad spectacle. What a horror. I share the emotion of the French nation which is also ours." Prime Minister Edouard Philippe said: "Our sadness is beyond words but we are still fighting. Tonight firefighters are fighting heroically against the fire to preserve what they can." Mayor of Paris Anne Hidalgo used a Latin phrase used to represent Paris since around 1358, which roughly translates as: "[She] is tossed by the waves but does not sink". "I do not have strong enough words to express the pain that I feel in the face of the #NotreDame flames. Tonight, all Parisians and Frenchmen mourn this symbol of our common history. From our motto, we will draw the strength to rise. Fluctuat NEC mergitur," she tweeted.